For the assault detachments of the German army during World War I, see Stormtrooper. The Sturmabteilung (SA; German pronunciation: [ˈʃtʊɐ̯mʔapˌtaɪlʊŋ]), literally Storm Detachment, functioned as the original paramilitary wing of the Nazi Party (NSDAP). It played a significant role in Adolf Hitler's rise to power in the 1920s and 1930s. Their primary purposes were providing protection for Nazi rallies and assemblies, disrupting the meetings of opposing parties, fighting against the paramilitary units of the opposing parties, especially the Red Front Fighters League (Rotfrontkämpferbund) of the Communist Party of Germany (KPD), and intimidating Slavic and Romani citizens, unionists, and Jews – for instance, during the Nazi boycott of Jewish businesses. The SA have been known in contemporary times as "Brownshirts" (Braunhemden) from the color of their uniform shirts, similar to Benito Mussolini's blackshirts. The SA developed pseudo-military titles for its members. The SA ranks were adopted by several other Nazi Party groups, chief amongst them the Schutzstaffel (SS), which originated as a branch of the SA before being separated. Brown-coloured shirts were chosen as the SA uniform because a large batch of them were cheaply available after World War I, having originally been ordered during the war for colonial troops posted to Germany's former African colonies. The SA became disempowered after Adolf Hitler ordered the "blood purge" of 1934. This event became known as the Night of the Long Knives (die Nacht der langen Messer). The SA was effectively superseded by the SS, although it was not formally dissolved until after the Third Reich's final capitulation to the Allied powers in 1945. The term Sturmabteilung predates the founding of the Nazi Party in 1919. Originally it was applied to the specialized assault troops of Imperial Germany in World War I who used Hutier infiltration tactics. Instead of large mass assaults, the Sturmabteilung were organised into small squads of a few soldiers each. The first official German Stormtrooper unit was authorized on 2 March 1915—the German high command ordered the VIII Corps to form a detachment to test experimental weapons and develop tactics that could break the deadlock on the Western Front. On 2 October 1916, Generalquartiermeister Erich Ludendorff ordered all German armies in the west to form a battalion of stormtroops. They were first used during the 8th Army's siege of Riga, and again at the Battle of Caporetto. Wider use followed on the Western Front in the Spring Offensive in March 1918, where Allied lines were successfully pushed back tens of kilometers. The DAP (Deutsche Arbeiterpartei or German Workers' Party) was formed in Munich in January 1919 and Adolf Hitler joined it in September of that year. His talents for speaking, publicity and propaganda were quickly recognized, and by early 1920 he had gained authority in the party, which changed its name to the NSDAP (Nationalsozialistische Deutsche Arbeiterpartei or National Socialist German Workers' Party) in February 1920. The precursor to the SA had acted informally and on an ad hoc basis for some time before this. Hitler, with an eye always to helping the party to grow through propaganda, convinced the leadership committee to invest in an advertisement in the Münchener Beobachter (later renamed the Völkischer Beobachter) for a mass meeting in the Hofbräuhaus, to be held on 16 October 1919. Some 70 people attended, and a second such meeting was advertised for 13 November in the Eberlbrau beer hall. Some 130 people attended; there were hecklers, but Hitler's military friends promptly ejected them by force, and the agitators "flew down the stairs with gashed heads." The next year, on 24 February, he announced the party's Twenty-Five Point program at a mass meeting of some 2000 people at the Hofbräuhaus. Protesters tried to shout Hitler down, but his army friends, armed with rubber truncheons, ejected the dissenters. The basis for the SA had been formed. Hitler and Hermann Göring with SA stormtroopers at Nuremberg in 1928. A permanent group of party members who would serve as the ruffian Saalschutzabteilung (meeting hall protection detachment) for the DAP gathered around Emil Maurice after the February 1920 incident at the Hofbräuhaus. There was little organization or structure to this group. The group was also called the Ordnertruppen around this time. More than a year later, on 3 August 1921, Hitler redefined the group as the "Gymnastic and Sports Division" of the party (Turn- und Sportabteilung), perhaps to avoid trouble with the government. It was by now well recognized as an appropriate, even necessary, function or organ of the party. The future SA developed by organizing and formalizing the groups of ex-soldiers and beer hall brawlers who were to protect gatherings of the Nazi Party from disruptions from Social Democrats (SPD) and Communists (KPD) and to disrupt meetings of the other political parties. By September 1921 the name Sturmabteilung was being used informally for the group. Hitler was the official head of the Nazi Party by this time. On 4 November 1921 the Nazi Party held a large public meeting in the Munich Hofbräuhaus, which also attracted many Reds and other enemies of the Nazis. After Hitler had spoken for some time, the meeting erupted into a melee in which a small company of SA thrashed the opposition. The Nazis called this event the Saalschlacht ("meeting hall battle"), and it assumed legendary proportions in SA lore with the passage of time. Thereafter, the group was officially known as the Sturmabteilung. The leadership of the SA passed from Maurice to the young Hans Ulrich Klintzsch in this period. He had been a naval officer and a member of the Ehrhardt Brigade of Kapp Putsch fame and was, at the time of his assumption of SA command, a member of the notorious Organisation Consul (OC). The Nazis under Hitler were taking advantage of the more professional management techniques of the military. In 1922, the Nazi Party created a youth section, the Jugendbund, for young men between the ages of 14 and 18 years. Its successor, the Hitler Youth (Hitlerjugend or HJ), remained under SA command until May 1932. From April 1924 until late February 1925 the SA was reorganized into a front organization known as the Frontbann to circumvent Bavaria's ban on the Nazi Party and its organs (instituted after the abortive Beer Hall putsch of November 1923). Members of the SA were, throughout the 1920s and into the 1930s, often involved in street fights called Zusammenstöße (collisions) with members of the Communist Party (KPD). In 1929, the SA added a Motor Corps for better mobility and a faster mustering of units. 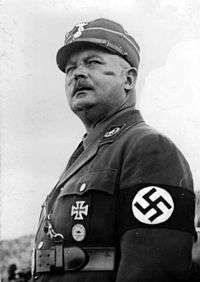 Under their popular leader, Stabschef (Staff Chief) Ernst Röhm, the SA grew in importance within the Nazi power structure, growing to thousands of members. In the early 1930s, the Nazis expanded from an extremist fringe group to the largest political party in Germany, and the SA expanded with it. By January 1932, the SA numbered approximately 400,000 men. Many of these stormtroopers believed in the socialist promise of National Socialism and expected the Nazi regime to take more radical economic action, such as breaking up the vast landed estates of the aristocracy once they obtained national power. However, once Hitler had achieved supreme power, the SA was no longer needed. An organization that could inflict more subtle terror and get total obedience was needed, and the SA (born out of street violence and beer hall brawls) was simply not capable of doing so. The younger Schutzstaffel (SS) had evolved to be more than a bodyguard unit for Hitler and showed itself better suited to carry out Hitler's policies, including those of a criminal nature. After Hitler and the Nazis obtained national power in January 1933, the SA became increasingly eager for power itself. By the end of 1933, the SA numbered three million men and many saw themselves as a replacement for the "antiquated" Reichswehr (German Army). Röhm's ideal was to absorb the Reichswehr (then limited by law to no more than 100,000 men) into the SA, which would be a new "people's army". This deeply offended and alarmed the Reichswehr, and threatened Hitler's goal of co-opting the Reichswehr. The SA's increasing power and ambitions also posed a threat to the other Nazi leaders. Originally an adjunct to the SA, the SS was placed under the control of Heinrich Himmler in part to restrict the power of the SA and their leaders. In 1933, General Werner von Blomberg, the Minister of Defense, and General Walther von Reichenau, the chief of the Reichswehr's Ministerial Department, became increasingly concerned about the growing power of the SA. Ernst Röhm had been given a seat on the National Defense Council and began to demand more say over military matters. On 2 October 1933, Röhm sent a letter to Reichenau that said: "I regard the Reichswehr now only as a training school for the German people. The conduct of war, and therefore of mobilization as well, in the future is the task of the SA." Blomberg and von Reichenau began to conspire with Hermann Göring and Heinrich Himmler against Röhm and the SA. Himmler asked Reinhard Heydrich to assemble a dossier on Röhm. Heydrich recognized that for the SS to gain full national power the SA had to be broken. He manufactured evidence that suggested that Röhm had been paid 12 million marks by French agents to overthrow Hitler. Hitler liked Röhm and initially refused to believe the dossier provided by Heydrich. 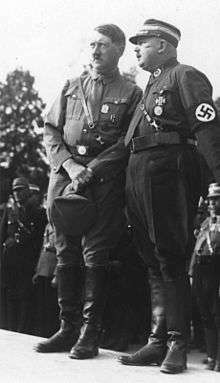 Röhm had been one of his first supporters and, without his ability to obtain army funds in the early days of the movement, it is unlikely that the Nazis would have ever become established. The SA under Röhm's leadership had also played a vital role in destroying the opposition during the elections of 1932 and 1933. The architects of the purge: Hitler, Göring, Goebbels, and Hess. Only Himmler and Heydrich are missing. Hitler had his own reasons for wanting Röhm removed. Powerful supporters of Hitler had been complaining about Röhm for some time. The generals were fearful of Röhm's desire to have the SA, a force of over three million men, absorb the much smaller German Army into its ranks under his leadership. Furthermore, reports of a huge cache of weapons in the hands of SA members gave the army commanders even more concern. Industrialists, who had provided the funds for the Nazi victory, were unhappy with Röhm's socialistic views on the economy and his claims that the real revolution had still to take place. Matters came to a head in June 1934 when President von Hindenburg informed Hitler that if a move to curb the SA was not forthcoming, then he would dissolve Hitler's Government and declare martial law. Hitler was also concerned that Röhm and the SA had the power to remove him as leader. Göring and Himmler played on this fear by constantly feeding him with new information on Röhm's proposed coup. A masterstroke was to claim that Gregor Strasser, whom Hitler hated, was part of the planned conspiracy against him. With this news Hitler ordered all the SA leaders to attend a meeting in the Hanselbauer Hotel  in Bad Wiessee. On 30 June 1934, Hitler, accompanied by SS units, arrived at Bad Wiessee where he personally placed Röhm and other high-ranking SA leaders under arrest. Over the next 48 hours, 200 other senior SA officers were arrested on the way to Wiessee. Many were shot as soon as they were captured but Hitler decided to pardon Röhm because of his past services to the movement. On 1 July, after much pressure from Hermann Göring and Heinrich Himmler, Hitler agreed that Röhm should die. Hitler insisted that Röhm should first be allowed to commit suicide. However, when Röhm refused, he was killed by two SS officers, Theodor Eicke and Michael Lippert. The names of eighty-five victims are known; however, estimates place the total number killed at between 150 and 200 persons. 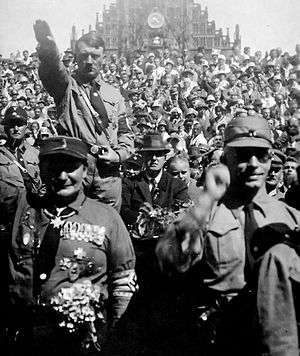 While some Germans were shocked by the killing, many others saw Hitler as the one who restored "order" to the country. Goebbels's propaganda highlighted the "Röhm-Putsch" in the days that followed. The homosexuality of Röhm and other SA leaders was made public to add "shock value" even though the sexuality of Röhm and other named SA leaders had actually been known by Hitler and other Nazi leaders for years. After the Night of the Long Knives, the SA continued to exist under the leadership of Viktor Lutze, but the group was largely placated and significantly downsized. However, attacks against the Jews escalated in the late 1930s and the SA was a main perpetrator of the actions. In 1943, Viktor Lutze was killed in an automobile accident and leadership of the group was assumed by Wilhelm Schepmann. Schepmann did his best to run the SA for the remainder of the war, attempting to restore the group as a predominant force within the Nazi Party and to mend years of distrust and bad feelings between the SA and SS. In the modern age, several Neo-Nazi groups claim they are continued extensions of the SA, with terms such as "stormtrooper" and "brown shirt" common in Neo-Nazi vocabulary, though these groups are often loosely organized with separate agendas. Hirden - paramilitary wing of the NS, the Norwegian National Socialist party 1940-45. 1 2 3 Kershaw 2008, p. 315. 1 2 McNab 2009, p. 22. ↑ The NSDAP and its organs and instruments (including the Völkischer Beobachter and the SA) were banned in Bavaria (and other parts of Germany) following Hitler's abortive attempt to overthrow the Weimar Republic in the Beer Hall Putsch in November 1923. The Bavarian ban was lifted in February 1925 after Hitler pledged to adhere to legal and constitutional means in his quest for political power. See Verbotzeit. 1 2 Mitcham, Samuel W. (1996). Why Hitler?. Praeger. p. 139. ISBN 0-275-95485-4. . Ironically, they shared this maxim with the Red Front. Hermann Dünow, Der Rotfrontkämpferbund, East Berlin: MNV, no date, pp. 65. Littlejohn, David (1990). The Sturmabteilung: Hitler's Stormtroopers 1921 – 1945. Osprey Publishing, London. Manchester, William (2003). The Arms of Krupp, 1587–1968: The Rise and Fall of the Industrial Dynasty That Armed Germany at War. Back Bay, ISBN 0-316-52940-0. Bessel, Richard (1984). Political Violence and The Rise of Nazism: The Storm Troopers in Eastern Germany, 1925–1934. Yale University Press, ISBN 0-300-03171-8. Campbell, Bruce (1998). The SA Generals and The Rise of Nazism. University Press of Kentucky, ISBN 0-8131-2047-0. Fischer, Conan (1983). Stormtroopers: A Social, Economic, and Ideological Analysis, 1929–35. Allen & Unwin, ISBN 0-04-943028-9. Merkl, Peter H. (1980). The Making of a Stormtrooper. Princeton University Press, ISBN 0-691-07620-0.